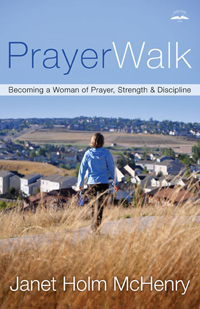 Today's review is "Prayer Walk: Becoming a Woman of Prayer, Strength and Discipline" by Janet Holm McHenry. From the back cover -"Thirteen years ago, author Janet Holm McHenry suffered from depression, weight gain, and exhaustion. Then she began a prayerwalk routing that not only transformed her life but also profoundly impacted the lives of those around her." The concept of prayerwalking is easy - praying as you walk for at least one hour, five days a week. The author gives a deeper explanation of prayer (that I absolutely LOVED),"spending time with God in adoration and intercession..." If you think that this amount of prayerwalking is unattainable, the author suggests making time. As a wife, mom of four extracurricular-active children, part-time writer, and Sunday school teacher, McHenry knows how far your schedule can be stretched but still made the time to prayerwalk. With prayerwalking, you also need strength and discipline. The author shows you how to attain it through her experiences and scripture. This 10th Anniversary Edition now includes a thirty-day prayer and fitness challenge, a guide to organizing a community prayerwalk, and a Bible study and discussion guide. This is a great book to read individually or in a group. I found prayerwalking very calming - helping to reduce my anxiety and gain clarity. Due to health reasons (and this Georgia heat) I had to take it easier. I plan to begin prayerwalking again when the cooler weather comes this fall. I highly recommend this book! Disclosure: I was provided a copy of this book without charge by the publisher to review. No other compensation was received. All opinions contained in this review are solely mine.